One-of-a-kind luxury fashion jewelry piece with astonishing sparkle and classy look. 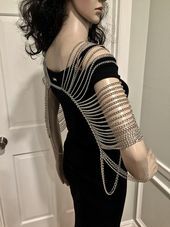 This unique, striking fashion shoulder jewelry piece has been entirely handmade by me. Matches perfectly with the strapless dress/shirt as well as with a dress/shirt with long sleeves. Made of clear crystals-glass pearl-silver tone base pendant; silver color metal chains; beautiful, sparkling clear crystal and silver color charms completing a choker; and of glass rhinestone chains. The silver tone chains and clear crystal rhinestones give an amazing glow when moving, and a luxurious look to the body figure. Unfortunately, the pictures don't show the smooth feeling and shiny look of the chains. It fits sizes: "XS", "S", "M", "L" and "XL". While working as a College Instructor and a Career Specialist, I could not find enough time to do things which I really wanted and which were meaningful and enjoyable to me. They are: creating, fashion, and art. Once I finished my successful career, I was finally able to devote my time to what I always wanted to do. Classy and elegant fashion has always been attractive to me as well as jewelry which helps in accessorizing every outfit.